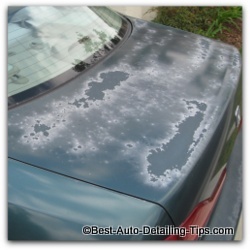 Car Paint Restoration tips any beginner can use and get amazing results! Car paint restoration with today's modern day car paint finishes is much different than the days of old. Unlike old school single stage paint jobs which could include anything from enamels, acrylics, or the ultimate in wet-look shine of a 20 layer, color-sanded lacquer paint job, modern day 2-stage paints are far easier than ever to care for and maintain. No longer do we get the chalky oxidation of paint that turned reds into chalky pinks, and blacks into chalky greys, or white into....well, just chalky looking white. The oxidation process of clear coat is vastly different than that of the older, single stage paint jobs that lacked the protection offered by modern day clear coats. Any car made today will have what is called a 2-stage paint job. Different than a single stage paint job in that the top layer is finished with a clear protective layer known as clear coat. While the industry preys upon your ignorance as a consumer and car owner, just as so-called experts like to over-dramatize the subject of clear coats by suggesting that special care and special products are required, this is essentially nothing more than misrepresentation and hype. Clear coats are essentially car paint with no pigments,and therefore need the same care and maintenance as old-school single stage paint jobs. Clear coat has been added to all paint jobs as part of the Original painting process done at the factory. Clear coat was developed as a permanent form of protection for the base color coat. "Darren, what does this all have to do with car paint restoration?" I am glad you asked. While clear coats are essentially clear car paint, there are some differences that should be noted and will help in restoring your car paint. Officially, most clear coats are acrylic urethane. If you wanted to really over-simplify the moment, you could even call the clear coat a form of plastic. Like many things in life, many terms exist and are used that are extreme generalizations and the term "plastic" is one of them. This picture depicts what is usually referred to in the business as clear coat failure. This is one of the big differences between single-stage paint and 2-stage paint. Clear coats don't actually oxidize in a way that single stage paint jobs do when they become dull, chalky, and faded. Clear coat starts to "dry out" for lack of a better word. It eventually looks like it was washed with a rag full of sand and eventually will either completely burn out with absolutely no shine to it, ot start to fail by lifting, blistering, and peeling like the picture shown. 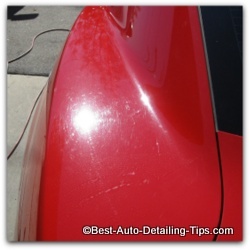 The picture taken from this red Camaro fender could actually highlight (2) problems when it comes to car paint restoration. Spider-webbing effect, and/or wash scratch. Neglected clear coat that has become dried out. Your car paint is beginning to age and looks less than you know it can or that is used to. Fine scratches, swirl marks, spider-webbing, wash-scratch, etc. 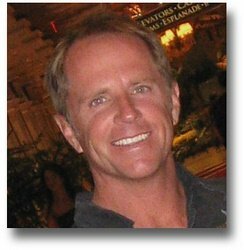 "Most people do not realize how much easier it is to restore the car paint with the latest in professional detail equipment and products"
The detailing industry is continually looking for ways to bridge the gap between professional detailing and inexperienced car owners or car enthusiasts who are looking to produce the same results as seasoned professional detail veterans. The really good news is that with the right choice in tools and products, any newcomer to the world of car care can produce amazing results ans restore the paint on our car to a level never possible for the truly new beginner. Complete Paint Restoration System: Restore Your Car Paint without any Swirls, Buffer Tracks, or Holograms! Yes, believe it or not, anyone can now put themselves behind this paint restoration system and produce amazing results that were traditionally reserved for professional detailers. With the combination of the user friendly DA (dual-action/random orbital) car buffer, the right car polishes and polishing pads, now a true beginner can achieve amazing results right out of the box! This kit from Griot's Garage would be my first pick! A quality car polisher that is the winning balance of performance, price, and user experience. Perfect for any true beginner to intermediate professional detailer. This car paint restoration kit by TORQ is another highly rated kit. Not quite as well known as Griot's, but very highly rated. You simply will not go wrong with either kit. Everything you need to restore that shine and depth to your cars paint. The only draw back with this kit is that you should invest in a clay bar kit to decontaminate your paint after washing your car, and before you actually polish it. So let me break it down for you as to why I don't think you need to go into anxiety mode when trying to perform car paint restoration, or over-think the buying decision. Because these are both complete kits (except the Torq, as it does not come with the detailing clay to decontaminate your paint first), you will save money and time by not having to source all the individual tool/products separately.